The Dead South are a Canadian acoustic band from Saskatchewan. The band features Nate Hilts on guitar/ vocals, Scott Pringle - mandolin/ guitar/ vocals, Danny Kenyon - cello, Eliza Mary Doyle - banjo and Erik Mehlson - cello. 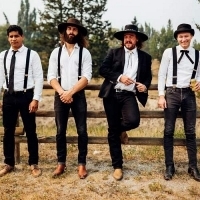 "The Dead South have been described as outlaws, modern hillbillies and Mumford and Sons' evil twins, but the best way to describe the Regina-based band is fearless. They're a rare musical commodity - a band that's equally compelling on record as they are on stage. While The Dead South's signature blend of bluegrass and classic folk is familiar, it's also eminently fresh; fuelled by the kind of energy and ethic you'd associate with a punk band."